This is the tail end of the mauve fabrics that I own. Some are new Robin Pandolph's and Sandy Gervis' and some are old. There are even some scraps from the first curtains I ever made back in 1990. The very thought of mauve curtains, yikes!! But, they were cute in their day. And, now instead of decorating windows these fabrics will be warming babies. That's a nice little transition. 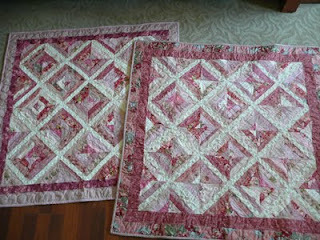 I love your mauve string quilts...they will make any baby warm. Glad to know you used the cutains from the 1990's with the new fabrics, I like to mix very, very old fabrics with new ones too. Lovely, lovely. 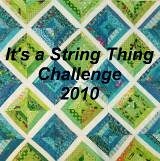 All your string quilts are inspirational. I love the way you took your 90s mauve fabric and made it look contemporary by using it in a string quilt.